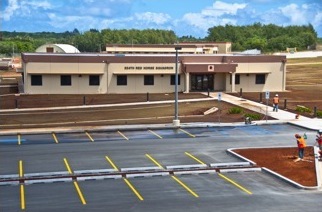 Black Construction Corporation (BCC) was initially awarded a $5,243,281 subcontract by prime contractor Overland Federal, LLC under the SB-MACC Program for the design management and construction of the Red Horse Headquarters/Engineering Facility at PRTC, Northwest Field, Andersen AFB, Guam for the 554 Red Horse Squadron under U.S. Navy Contract No. N40192-10-D-2803-0003. The original completion period was 526 calendar days. Thereafter, six (6) owner requested contract modifications extended the project completion date by 167 calendar days and increased BCC’s total subcontract amount to $5,432,518. The project scope entailed a 16 ft. high, single story 8,866 SF building and related site improvements. The work included a raised building pad on 3,000 CY of engineered fill and construction of a reinforced concrete building with precast tilt-up wall panels, steel roof joists, and composite metal deck – concrete topping roof. The building’s door and window canopies and column supported front and rear entry porches were all constructed of cast in place reinforced concrete. The facility was designed and constructed with blast resistant doors, windows and typhoon screens to meet project ATFP requirements and incorporated several environmentally sustainable features including high R-value insulation, high energy efficiency, DDC controlled, central air conditioning system, 10KW building integrated photo-voltaic array and enhanced commissioning designed to achieve a LEED Silver rating for the facility. The building is protected with wet pipe sprinkler and firealarm systems. The Red Horse HQ/Engineering Facility houses an entrance lobby with custom display case, several offices, conference rooms, training room, library, break room, public spaces, restrooms and showers, mechanical/ electrical and communications rooms, and materials testing laboratory. First quality finishes were provided throughout the building including coved gypsum board and acoustic ceilings, water resistant durarock and gypboard wall sheathing and oak wood chair rails. Low volatile paints and carpets were used extensively to protect indoor air quality. Ceramic floor and wall tiles were used in the restrooms and shower areas and quarry tile for the corridors and break room floors. The Red Horse Squadron’s unique horsehead logo is proudly displayed in etched glass at the entrance of the commanding officers area, within a mosaic floor tile inlay at the entrance lobby and recessed in the front entry porch fascia. Modular office system furniture, projector screens, emergency messaging system, and related amenities were also installed under the project. Site improvements included underground electric, telecomm., fire, water, and sewer utilities, 4,900 SY asphalt parking lot and entrance way, 260 SY asphalt driveway, 650 SY of concrete sidewalks, and related walkway and area lighting. CMU wall enclosures were provided for the mechanical equipment yard, transformer, and trash bins. Turf grass landscaping, area drains and culverts, extensive grass lined bioswales and a major drainage ditch to the southwest corner of the Red Horse campus were constructed to treat and regulate storm water run-off for both the headquarters facility and surrounding campus. BCC subcontracted approximately 27.5% of the work to local GCA contractors and associate members including all electrical work, landscaping, asphalt paving, interior and exterior painting, photo-voltaic system, elastomeric roof coating, carpeting, enhanced commissioning, HVAC-DDC system termination and programming, HVAC testing and balancing, pavement striping and traffic signage.